On Saturday, the second day of World Cup cross-country racing ensued in Lillehammer, Norway with a 10-kilometer freestyle individual start race for the women. On a track of snow surrounded by green fir trees and a soggy landscape, the women skied two laps of 5 k course. Norway’s Therese Johaug was the fastest skier at every checkpoint to win in a time of 26:22.4 minutes. 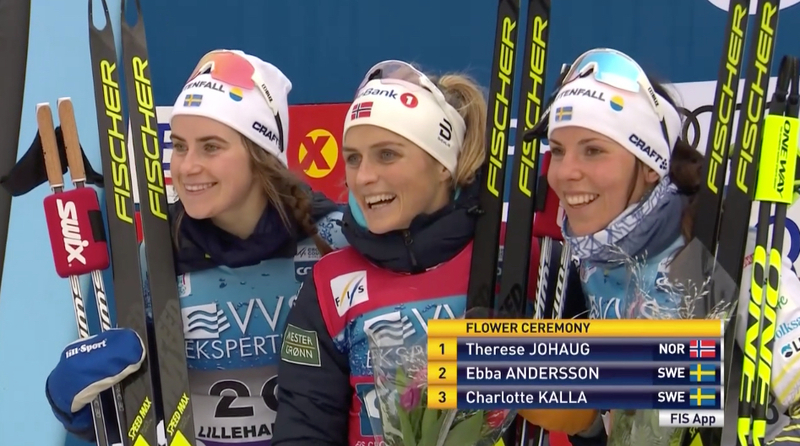 Ebba Andersson, the upstart Swede skied to second (+9.2), and teammate Charlotte Kalla was third (+15.7). Collectively, it was a strong day for the U.S. women with four skiers in the top-30. Sadie Bjornsen of the U.S. Ski Team (USST) finished in ninth (+1:17.0) after placing third in yesterday’s skate sprint. Rosie Brennan (APU) skied to 11th (+1:29.3), the USST’s Jessie Diggins 12th (+1:29.9), Caitlin Paterson (CGRP) 30th (+2:28.2), Kaitlynn Miller (CGRP) 60th (+4:10.4), and Ida Sargent of the USST 63rd (+4:18.4), and Kelsey Phinney (SMS T2) 65th (+4:22.5). No Canadian women were entered. Seventy-two skiers finished the women’s race. The men raced three times around the 5 k loop for 15 k total and three times up the course’s big climb. In this early season, many of the perceived pre-race favorites finished further back in the field. Norway’s Sjur Røthe won in a time of 36:34.0 minutes. By the 8.3 k time check, Røthe took control of the race. Teammate Didrik Tønseth placed second (+6.0), while Russia’s Denis Spitsov was third (+28.6). For the U.S., Erik Bjornsen of the U.S. Ski Team (USST) finished 43rd (+2:24.5), David Norris (APU) 54th (+2:44.5), Simi Hamilton (USST) 56th (+2:59.4), Paddy Caldwell (USST) 67th (+3:33.1), Kevin Bolger (USST) 68th (+3:38.7), Scott Patterson (USST) 73rd (+3:52.3), and Adam Martin (CGRP) 75th (+4:05.0). The fastest qualifier for the men on Saturday in West Yellowstone was SMS T2 athlete Andy Newell. The Vermont native, now residing in Bozeman, Mont., won in a time of 2:35.53 minutes. His margin of victory was 7.26 seconds over second fastest qualifier, Alaska Pacific University (APU) skier Logan Hannenman. Newell’s teammate, Ben Saxton qualified in third (+7.79). Newell advanced to the finals by winning the first heat and first semifinal. In the finals, Newell controlled the pace and made clear that at thirty five years old, he can still light up the domestic ranks. Newell won in a time of 2:41.66 minutes. Craftsbury Green Racing Project’s Ben Lustgarten placed second in 2:43.55 minutes, and University of New Mexico skier Ricardo Izquierdo-Bernier was third in 2:45.66 minutes. Adam Luban of the Sun Valley Ski Education Foundation Gold Team finished in fourth, Forrest Mahlen of Alaska Pacific University (APU) was fifth, and Ben Saxton (SMS T2) placed sixth in the men’s final. Julia Kern, a member of the U.S. Ski Development Team (UUSDT) and SMS T2 , won the women’s qualifier in 3:08.58 minutes. Second in the qualifier, also from SS T2, was Erika Flowers who finished 2.5 seconds behind Kern. University of Utah skier, Julia Richter qualified in third (+3.22). Like Newell, Kern won both her quarterfinal and semi to make the finals. Kern won the women’s final in 3:09.85 minutes. APU’s Rosie Frankowski, the day’s fourth fastest qualifier, was second in a time of 3:11.37 minutes. Teammate Hannah Halvorsen (APU/USSDT) placed third, stopping the clock in 3:12.51 minutes. Halvorsen placed sixth in the qualifier. Flowers ended up fourth in the finals, while Richter and Utah teammate Karianne Moe, placed fifth and sixth, respectively.